IT'S BACK baby!! Like every season of Game of Thrones, Uvaggio's killer wines just get better and better every year, oh yes. 91 POINTS! Priced to make us (and you!) tear up with joy! Our advice is to RIP the box open the moment this arrives. PERFECT porch-pounding, drink-with-anything, slam-dunk, joyous red. We totally crushed this deal....please, grab some and see for yourself. We're just going to say this now: UVAGGIO makes some of the very finest Italian varietals in America (many of you know this from previous purchases, too). To have some of this wonderful, racy, flavorful and beautifully-made Zinfandel-ish wine at a DROP-DEAD SILLY PRICE like this is nothing short of a reason to celebrate around here. So - here's what it tastes like: Italian Zinfandel. That's because the Primitivo grape is the genetic equivalent in Italy to our beloved American Zinfandel! Cool, right? Well, wait until you TASTE it (or quaff it, as the case may be, that is what’s happening here in the office…)! Winemaker Jim Moore created l’Uvaggio di Giacomo in 1998 (translated as 'the Blends of James', and the label eventually became simply Uvaggio. Their focus is accessible, affordable wines to be enjoyed with a meal. Fun Fact: Moore made the first Vin Santo in California. Aging/Cooperage: Three months in neutral oak cooperage prior to bottling. 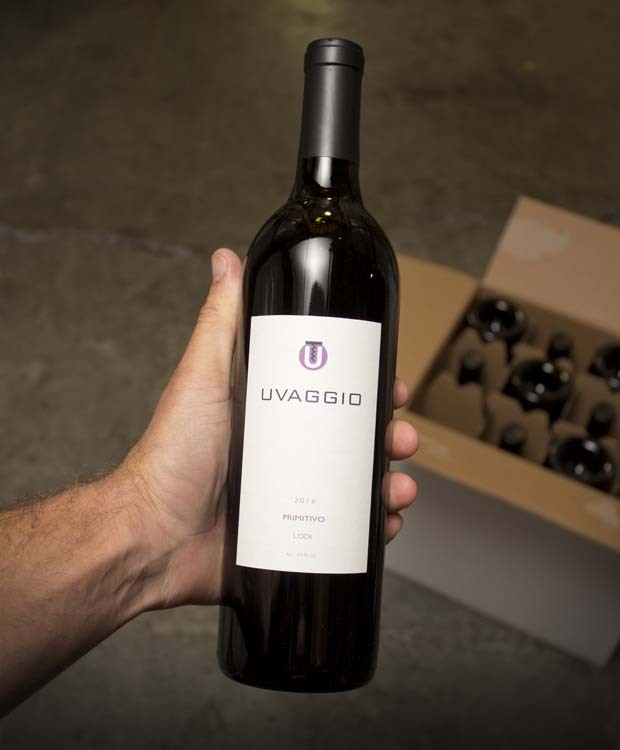 Uvaggio makes wine in California from grape varieties indigenous to Italy and the south of France. Expressions steeped in California's traditions, with a nod towards Europe’s restraint - a contemporary synthesis of these two approaches. The Uvaggio label is a vinous statement four decades in the making. The diverse portfolio consists of a range of wines, though focuses on Vermentino and Primitivo. Emphasizing attributes like vibrant flavors, moderate pricing, lower levels of alcohol, and balanced expressions, these are wines crafted for food affinity and daily enjoyment, bringing an Italian sensibility to the American table. With a belief that wine’s primary role is to accompany a meal, the success of the Uvaggio rests on three important attributes - their accessibility, harmony and value. Primitivo and pizza (or chili dogs)!